This mod allows dual wielders to parry/block attacks. - NONE of the content from this mod can be used in packages that require payment to be downloaded or used (for instance, if uploading on the Steam Workshop, the feature to require payment should NOT be used). other than www.skyrimnexus.com, forums.bethsoft.com or the Steam Workshop. redistributed on www.skyrimnexus.com or the Steam Workshop. for his work, and the original readme must be included. ScriptDragon version would've been impossible to make. I do not plan to update my mods to work with Skyrim Special Edition (SSE) any time soon myself, because I do not expect to have the time for that (just like I haven't had the time or interest to read comments and update any mods for the past few years already). - Please send me a PM on the nexus forums first, describing which of my mods you are planning to upgrade, for which versions of SSE, and await my response before uploading. If you have done any Skyrim modding that involves scripts before, please also include links to that. In case there are multiple people interested in upgrading the same mod, I'd prefer the most qualified (in terms of experience) person to do so, instead of having multiple people racing to be the first to upload the same mod. - You must clearly mention that I am not responsible for supporting, updating, or otherwise commenting on the SSE version of the mod. I will not have time to do that in an adequate manner. - If I ever do find the free time and the interest to actively start working with these mods again, I reserve the right to upload my own versions of these mods using the same (or similar) names. It would also be nice if you give me access to the files of your version of the mod, and/or the page where you uploaded it. Hi there guy, my name is M4ze. I recently tried to fix a few things in the SKSE version of this mod and I am now making it available for you to try. Just Download the 00 Dual Wield Parrying SKSE 3_0 beta or the 00 Dual Wield Parrying SKSE 3_1 beta Version and try it out. But be carefull and report any bugs you discover. 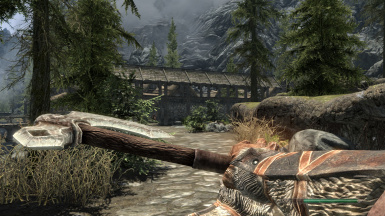 - A working, official copy of The Elder Scrolls V: Skyrim, updated to version 1.8.151.0 or higher. * SKSE is ONLY required if you choose to use the SKSE version of the mod! ** Script Dragon is ONLY required if you choose to use the Script Dragon version of the mod! Without this, there will be no in-game configuration menu to configure the SKSE version of the mod. * SkyUI 3.0 or higher is ONLY recommended if you choose to use the SKSE version of the mod. Other versions do not have a mod configuration menu anyway. with other new combinations of weapons (such as weapon in right hand + spell in left hand), but others are limited only to real dual wielding. All available versions will be listed and described in more detail here. I have listed them in the order in which I think they are ‘’best’’, so I highly recommend the first version in this list, unless for some reason you don’t like it’s requirements (in which case I recommend the second, etc.). 1. Dual Wield Parrying SKSE Only version still supported by M4ze. Tested on a completely unmodded game. - Adds a new ‘’Block Button’’. 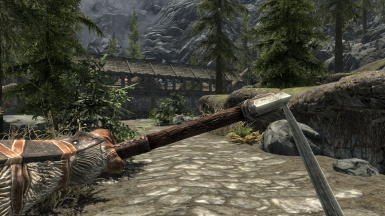 Pressing this button will allow you to block, just like pressing the Right Mouse Button would in vanilla Skyrim, except that this button also works with a large number of other weapon combinations. - If you have SkyUI 3.0-beta2 or higher installed, this version of the mod will have an in-game Mod Configuration Menu powered by SkyUI in which you can configure the block button. - By default, the block button is the ‘’V’’ key. - This version of the mod requires Script Dragon to be installed. - This version of the mod adds a new ‘’Block Button’’. 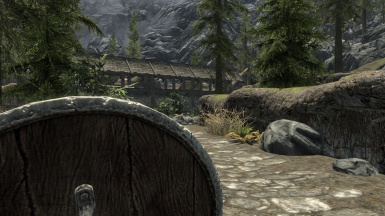 Pressing this button will allow you to block, just like pressing the Right Mouse Button would in vanilla Skyrim, except that this button also works with a large number of weapon combinations where RMB would do something other than attacking. - This key can be configured in the ''DualWieldParryingScriptDragon.ini'' file, located in your SkyrimDataasi folder. Just open this file using any common text editor like Notepad, and change the line which by default reads ''key=0x56''. How to change this is explained in the .ini file itself. - The same combinations of equipment are supported as in the SKSE version of the mod. - For this version of the mod, there is a separate version for Dawnguard users. - The default block button (which you also use to block when you have a shield) will now also allow you to block when dual wielding two one-handed weapons or when using your bare fists. - You can no longer control with which hand you strike when dual wielding weapons or using your fists. Instead, you will randomly sometimes use the left hand and sometimes the right hand. - This mod has no effect when you are sneaking. - Only the combinations One-handed Weapon + One-handed Weapon and Nothing + Nothing are supported. 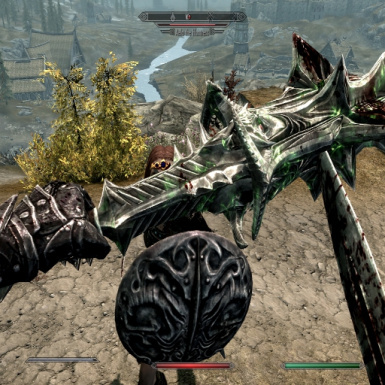 - In this version of the mod, you can no longer use your left hand to attack when dual wielding. 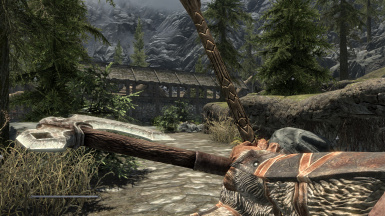 - The button which would let you attack with your left hand in vanilla Skyrim will now let you block when dual wielding. - Only the combination One-handed Weapon + One-handed Weapon is supported. - You can enter a ''parrying mode'' by tapping both mouse buttons at the same time. This puts you in a kind of automatic blocking mode (which works the same as holding your block button with a shield would, the difference being that you don't actually hold the button in this case). - Tapping both mouse buttons again breaks the ''parrying mode''. - Holding both mouse buttons will still execute a dual power attack (breaking the parry mode in the process if you were in parrying mode). - You can no longer perform a dual normal attack (because tapping both mouse buttons now has a different effect). - You can enter the same ''parrying mode'' described in the previous version by tapping both mouse buttons. - By holding both mouse buttons, you enter a similar parrying mode which you also automatically leave after a short duration again. - You can leave the longer duration parrying mode by holding both mouse buttons. - Both dual normal attacks and dual power attacks can no longer be executed. - Deactivate the mod’s .esp file in the game’s launcher. - Load your saved game with which you wish to continue playing, where a previous version of the mod was active. Press ‘’Yes’’ when a pop-up appears about unavailable content. - Now install the new version and continue as you would normally with your clean save. - Sometimes it´s simply not possible to update the mod, if you are experiencing troubles with your savegame, go to the start-menu, open the console, type: "coc whiterun", press enter and test it again. If it is still not working, something went wrong while updating. I am working on this issue, but it seems to be a problem with the game engine itself. If you find a way to fix this problem, please dont keep it to yourself and contact me. You can choose to either install the mod using the Nexus Mod Manager or to install manually. Simply press the ‘’Download With Manager’’ button and let NMM do all the installing work for you as you would with any other mod. - Unpack the downloaded package in a temporary location. - Copy the Data folder in the unpacked folder. <Steam Installation Directory>SteamSteamAppsCommonSkyrim. This folder will also contain files such as ‘’TESV.exe’’. - When you launch the game, make sure to enable the mod’s .esp file (name starting with ‘’Dual Wield Parrying’’) in the launcher’s Data Files tab. Uninstallation works differently depending on whether you installed the mod using the Nexus Mod Manager or manual installation. If you previously installed the mod using NMM, you can simply let NMM uninstall the mod for you as well. - In this Data folder, delete the mod’s .esp file. Depending on which version you initially chose to install, there may also be some extra files in the subfolders asi or Scripts. is neglected. Realistically the negative effects of this would only become noticeable after uninstalling and reinstalling the mod thousands of times without performing this extra step, but the option is still there in case you want to be absolutely sure that everything is removed correctly. There are no known incompatibilities at this time. It can happen that in some locations the bashing isn´t working any more: Instead of bashing the actor will perform a weird animated double attack. If you are experiencing this issue, please write your experience into this threat: Bug Report(M4ze). Q: I see no configuration menu in-game! A: Make sure you installed a proper version of SkyUI which includes MCM functionality and installed it correctly. Q: The mod doesn’t work! A: Make sure you installed the requirements of the chosen version correctly. Make sure you installed all parts of this mod correctly. Make sure the mod’s .esp file is activated in the game’s launcher. Make sure you have a legal version of Skyrim updated to the latest official version. Q: Does it work with an Xbox 360 Controller? A: The SKSE version should work fine with an Xbox 360 Controller, although you may find yourself lacking available buttons so you may have to rebind some default Skyrim controls to free up buttons. For the Script Dragon version, you can try the optional Xbox 360 Controller Package and read the instructions there, but be warned; this installation can get quite complicated, and I can’t help with this any further than the extra instructions already included in that package. Q: Can I bash when blocking in the SKSE or Script Dragon versions? A: This depends on which equipment combination you’re using. Most of the new combinations do not have a true bash, but pressing the normal attack button whilst holding the new block button will allow you to perform some sort of attack in most cases instead. Q: I am using the Random Attacks version of the mod and suddenly my Crossbows do not work anymore! A: You should have installed the special Dawnguard variant of the Random Attacks version. Instead you picked the standard Random Attacks version. Q: Will Block perks work with the blocking added by this mod? Does blocking with this mod improve Blocking skill? A: Yes, and yes. As for perks, those which were specific to shields in vanilla Skyrim will still be specific to shields though. Q: I manually installed one of the versions and want to uninstall now and can’t remember which files were included! A: Listing all the different files for all the different versions is too much work and would get too confusing in the readme. Instead, redownload the same file you initially chose and unpack it in some separate location to look at the package’s folder structure and see which files were included. - Now you should be able to bash correctly. Bashing with a melee weapon in the left hand still does not always work, but should work most of the time. - The mod should now hopefully continue to work correctly after loading a saved game even for those users for which this did not work correctly in previous versions. - Users of the SKSE version of the mod will now automatically block as soon as they can if they keep holding the block button after pressing it when blocking was impossible (for example, if the player now presses the block button whilst in the middle of an attack animation, and holds the button, he will start blocking immediately when the attack is finished). - Added the SKSE version of the mod. - Rewrote the readme and added a FAQ for improved clarity. - Split up all the different versions of the mod into separately downloadable packages. Now you only need to download and install those files which you’ll really use. 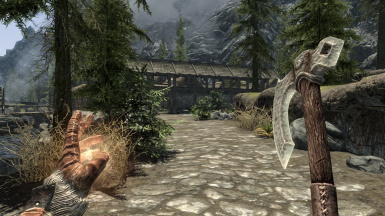 - Added a new Random Attacks version compatible with Dawnguard. - Updated the Random Attacks version of the mod to be compatible with Dawnguard. Now it should be possible again to properly fire crossbows with this version of the mod installed. - Removed the functionality from Random Attacks version when sneaking. This means that when sneaking, you can no longer block, but you do have control over which hand to strike with again, which means that you can for example choose to always strike with the weapon with the highest sneak attack multiplier. - Made a small performance improvement. - Added unarmed support for the RandomAttacks version. - Added the optional XBox 360 Controller Package for Script Dragon version. - Fixes a bug with the RandomAttacks version where powerattacking with a two handed weapon or a weapon+shield would sometimes fail and result in executing a normal attack. - Added the ScriptDragon version, allowing for a dedicated blocking hotkey and removing the need to replace or remove other moves. - ScriptDragon version also adds basic support for spellswords and fistfighters. - Added a new version: Dual Wield Parrying_RandomAttacks.esp. - Added a new version: Dual Wield Parrying_LeftHand.esp. - Optional version released which replaces the dual normal attack instead of dual power attack. - ALL FILES IN THE DOWNLOAD ARE PROVIDED ''AS IS'' WITHOUT ANY WARRANTY OR GUARANTEE OF ANY KIND. IN NO EVENT CAN THE AUTHOR BE HELD RESPONSIBLE FOR ANY CLAIMS, WHETHER OR NOT THEY ARE RELATED TO THE DOWNLOAD. - In unedited form, this mod may only be redistributed on sites other than www.skyrimnexus.com. If you redistribute the same mod on other sites, you MUST inform your users that the original author will not look for feedback or assist in troubleshooting on any site other than www.skyrimnexus.com or forums.bethsoft.com. - If edited, changed or improved upon, this mod may also be redistributed on www.skyrimnexus.com. - IN BOTH OF THE ABOVE CASES, the original author must be credited for his work, and the original readme must be included. The author can be contacted through private messages on the nexus sites and on the official bethesda softworks forums, in both cases under the name ''Borgut1337''. The author will also read the comments section of his mod on www.skyrimnexus.com regularly. - AlexanderBlade: For making Script Dragon, without which the ScriptDragon version would've been impossible to make. - Subvita, for figuring out a way to use the Script Dragon version with an XBox 360 controller.